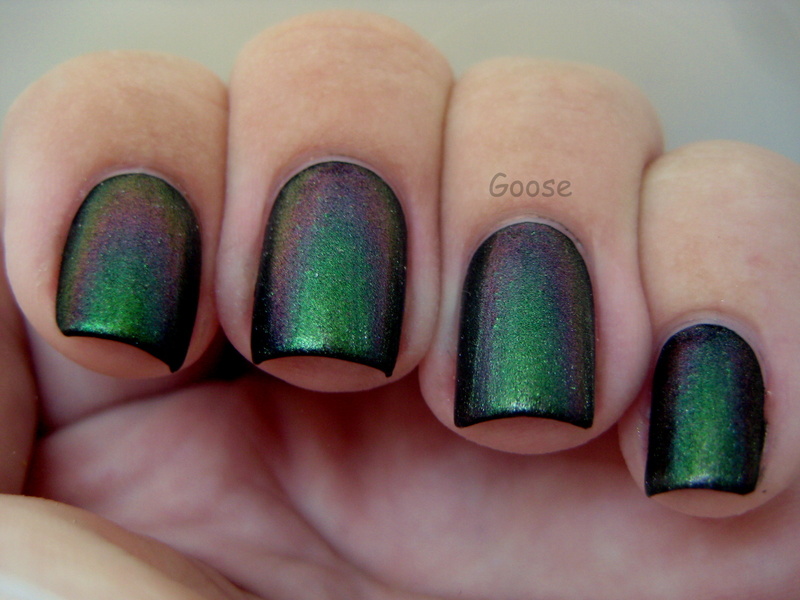 This is a pretty awesome polish altogether. 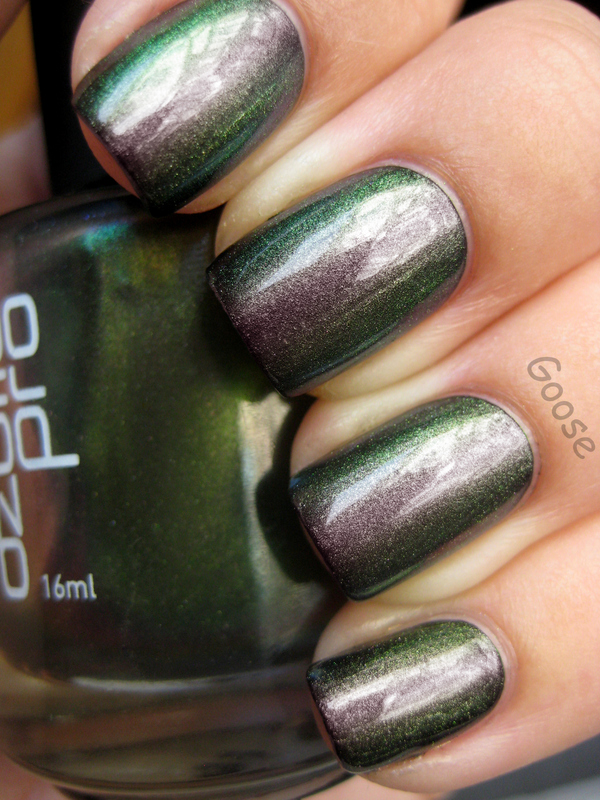 I've heard some say that it is not a very strong duochrome, and I have to disagree - the two main colors, a grassy lime green and a purple/grey/bronze, are almost ALWAYS present at the same time in most lighting. But in addition, it also has a subtle multichrome rainbow (the oil-slick type) that shows up at extreme angles. This is 3 coats of 503 over 1 coat of Wet'n'Wild Black Creme. **Just a note: This polish was a PAIN to photograph. I could not for the life of me get the purple/bronze to show up AT ALL! It just looked plain green (which is why a lot of pics of this color just appear to be solid green). So my gracious and wonderful friend actually edited the color into the photos, and it looks exactly how it does in person. 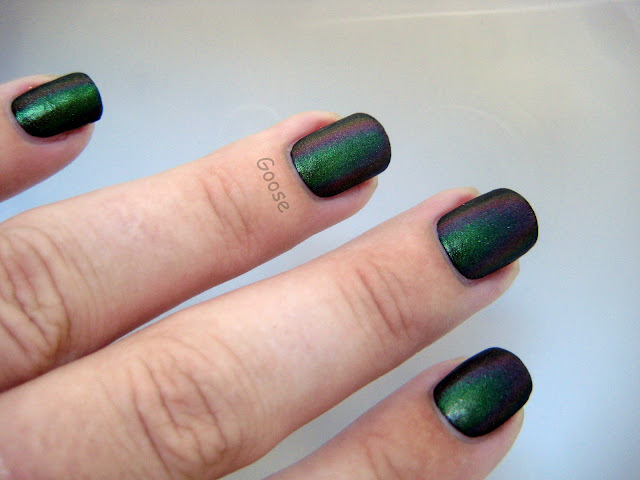 To show the cool multichrome, I used my new "underwater trick." Basically I just submerged my hand into a bowl of water and snapped some pics! But check out how it shows ALL of the colors at once! I've started using this technique for photographing all of my duo/multichromes, so I will have others to show you as well very soon. This is gorgeous...and that underwater trick is pretty interesting as well! This is so cool - and WOW. That's a new trick I'm going to have to try, thank you! Best pics I've seen of this! Seriously gorgeous! I have Artform 503 - same thing, diff label - and it's so amazing, the best of the Ozotics in my opinion! I'm usually not too much into duochromes, but this one is amazing! What a fantastic idea for taking pictures!! :D Amazing swatch!